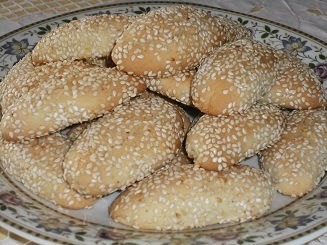 This recipe for sesame cookies (Koolooria me Soosami) is very simple and you'll find them really lovely to accompany your coffee or tea! Beat the butter and icing sugar well in the mixer. Add the egg and continue mixing for another 1-2 minutes. Add the brandy and continue mixing for another 1-2 minutes. Sprinkle the baking powder over the flour and add to the mixture in the mixer. Using the kneading attachment in the mixer, beat lightly until it has become a dough. Cover the dough with cling film and put in the fridge for 1 hour. Make cylindrical cookie shapes from the dough, approx. 7cm long. Roll the cookies in the sesame seeds so that they are covered all over and place them on an oven tray with greaseproof paper. One of my many favorite Greek pastries.